Last week I got a hold of the HTC G1 Android Developer Phone. This (how else) was preceded by a big fight with my cellular operator who insisted that I will take a data plan. Ok, I said to myself, I bought this phone so that obviously mean I will use cellular internet. "So how much is that data plan?" I asked the representative. "It's 1000K" she replied. "1MB?" I asked in wonder. "No, not 1MB – 1000 KB!" That's when I understood she has no clue what she's talking about. Furthermore, this "joke-data plan" was limited to WAP browsing. Oh come on!!!! And I can't replace it for a real data plan; I have to add money on top of it! Well, I do not want to bore you with this specific war, because this is only a prolog for this post, but let's just say it pays off to be stubborn. I ended up with no obligation to any data plan (which of course I took one, but now I can cancel it any time). Now that I've got THAT over with, I got around to checking out this wonderful phone (and forgive me iPhone fans – I'm not saying this is BETTER than iPhone, only that it's DIFFERENT). The phone itself has full QWERTY keyboard underneath the 480x320 touch screen. You can use physical or touch keyboard as input method. And what's really awesome about the current version of Android (ie "Cupcake") is the support of keyboard in their SDK, which instantly lead me to find a keyboard in my language – both touch and physical. First thing, when you get the phone you need to connect it with your Google account. This can be good, if your main account is Google/Gmail and a bit pain if you use other services. Also, the phone supports Unicode, so in order to display characters, all I needed to get the proper fonts and overwrite the default fonts. Oh, the ADP1 version is completely unlocked with root access to the UNIX. So you can do whatever you like – you have all the permissions. The OS itself is very intuitive. You have 3 desktop areas which you can fill with everything you want (contacts/widgets/applications/folders) and you can extend it with an application called AnyCut to get a shortcut to ANYTHING (even a specific settings page). Android Market has tons of free stuff. Some applications are, in my opinions, must to have. And of course there are gadgets. Like the application "Bubble" which turns your phone into a level meter, or "Shazam" which identifies any song in the background, or "Google SkyMap" which tells you what stars you are looking at. The downside (for now) is GPS. This device is using Google Maps which doesn't work very well in my country, and also consumes a lot of cellular internet. This of course should be resolved any time soon with 3rd party software becoming available. The touch screen works extremely well. There is no multi-touch support in the official cupcake version, but in JF (which are not the official builds, but rather really tweaked and improved ones) builds it is available. I personally haven't tried JF yet, but I read great things about it. Applications are installed in the phone memory which is not that big, and that's a downside. But it does support microSD and microSDHC so you can have 8gb (or maybe more?) of data storage which is really cool. 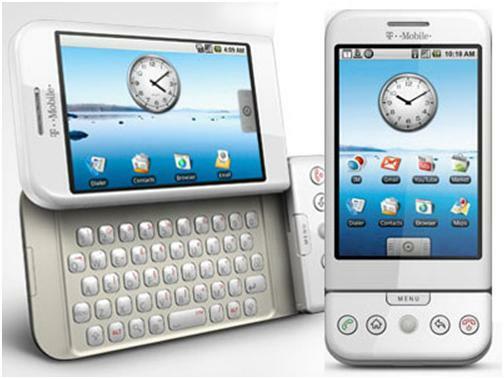 To summarize my post – I think this is a really cool phone. I enjoy every second with it. I know a lot of people will see it as a lot less cool than the iPhone, but that's really a matter of taste. You can get it in the US for 399$ + 25$ Google fee. 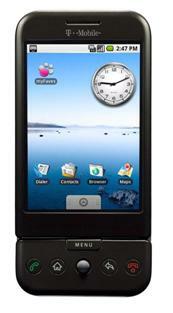 This is related to the ADP1 phone with no obligation to T-Mobile. I had it sent to a friend there who brought it to me, so I guess this is the only way because they do not internationally ship everywhere, only limited countries.